is the potential energy. is the total mass, and and are some average radius and squared velocity. 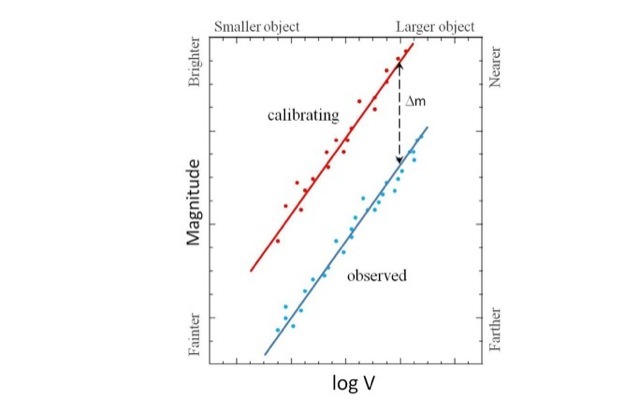 where is some sort of operationally defined squared velocity (for instance, the square of the maximum rotational velocity in a spiral galaxy, or of the velocity dispersion in an early type) and the parameter reflects the kinematical structure of the object (relative weight of disordered over ordered motions, anisotropies, etc.). We further place: , where is the total luminosity, is an operationally defined surface brightness. The parameter reflects the luminosity structure of the object [not necessarily that in density] in the color in which is given ( is the same for galaxies with the same photometric trend). For instance, for a galaxy if radius and surface brightness are those at the effective isophote. By the only assumption of virialization, we have obtained two relations which can be used to gauge distances. In fact, they relate distance independent observable (a surface brightness and a velocity) with other observables which depend on distance (a characteristic radius or the total luminosity[remember that we measure angles rather than distances, and fluxes]. Note that, if this relation holds for absolute magnitudes it holds as well for apparent magnitudes provided that, in the second case, it is applied to galaxies all at the same distance, as it is for objects belonging to the same cluster [but remember the problem of the membership]. In this case, in fact, the distance modulus, , is constant. 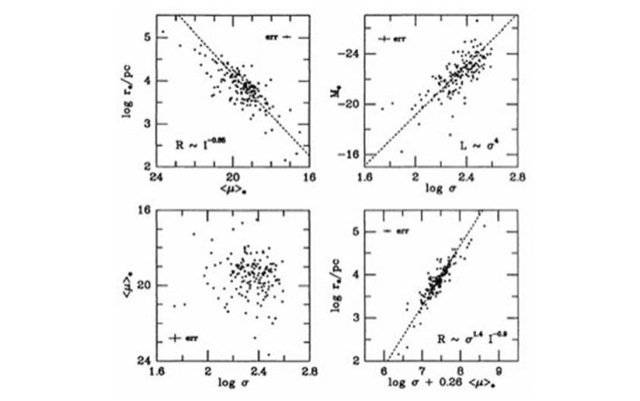 Comparison between the luminosity-velocity relations for two clusters with distance moduli differing by 5m. 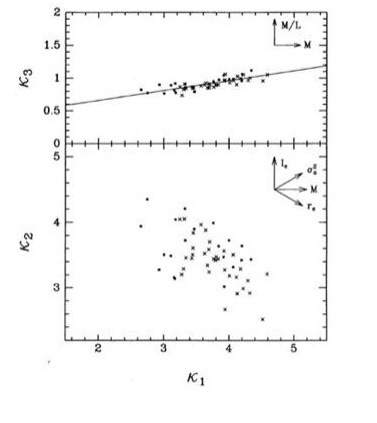 The simplest assumptions relative to the luminosity-velocity relations were originally used by the Estonian pioneer astronomer E. Öpik to derive, as early as 1922 (Ap.J., 55, 406), a distance of for the Andromeda nebula (a measure preceding the seminal work by Hubble and closer to the modern value of ). In 1977 (AA, 54, 661) B. Tully and R. Fisher applied the relation to Local Group spirals (with known distances and thus absolute luminosities). Comparison with similar measurements for objects of the M81 and M101 groups [remember that galaxies in groups or clusters share about the same distance from the observer] and in the Virgo cluster allowed them to estimate the distances of these systems and the value of the Hubble constant. TF relation for calibrating LG galaxies and 8 Virgo spirals, shifted in luminosity to fit the trend of the calibrators. Here the subscript to the absolute magnitude M reminds us the dependence on the observing band. The relation applies well to spiral galaxies. As we said, (from “width”, since the first measurements were integrated HI line widths) is a kinematical estimator representing the velocity . Since Doppler effect measures only the radial component of the velocity, must be corrected for the inclination of the galaxy main plane to the line of sight. Other corrections [which?] are in order for the photometric measurements. Clearly, both and depend on the adopted photometric band. It is found that the slope increases with the wavelength while the dispersion decreases. Also, we may speculate (correctly) that depends on the morphological class (indeed S0s and early spirals have a smaller slope of the TFR than later types [guess why]). The most intriguing question is whether it epends from redshift (that is, on look-back time). 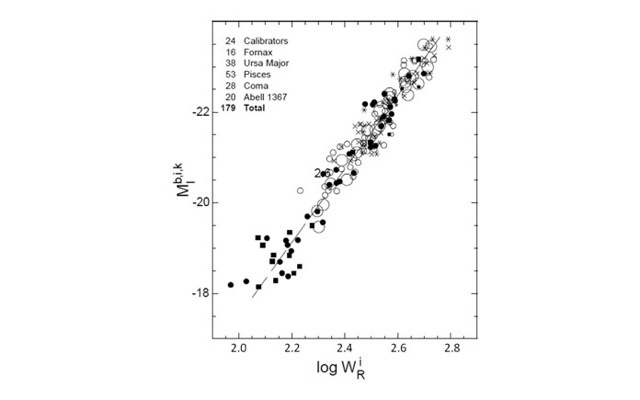 It is so: galaxies at are 1.5 mag brighter that objects with the same morphology and the same . This observation shows that the TFR can be used to gauge distances or to test cosmic evolution. At the RHS the modern TF relation for 5 galaxy clusters, all reduced at the same distance. Adapted from Tully and Pierce, Ap.J., 533, 744, 2000. The validity of this relation was first proved by S. Faber and Jackson (Ap.J., 204, 668, 1976) using the central velocity dispersion. 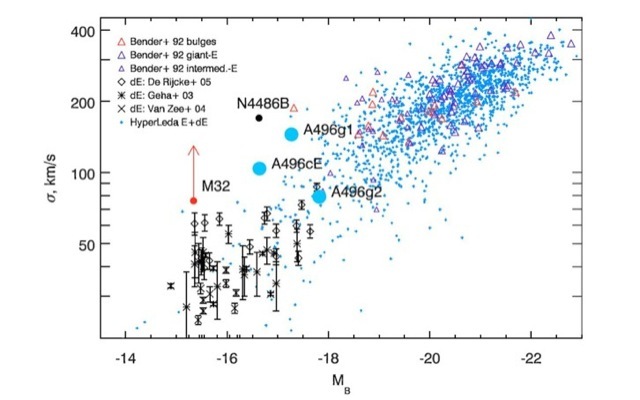 Recent studies on SDSS data have shown that the parameters of the FJ relation depend on the interval of magnitudes considered for the sample: both size and mean value. 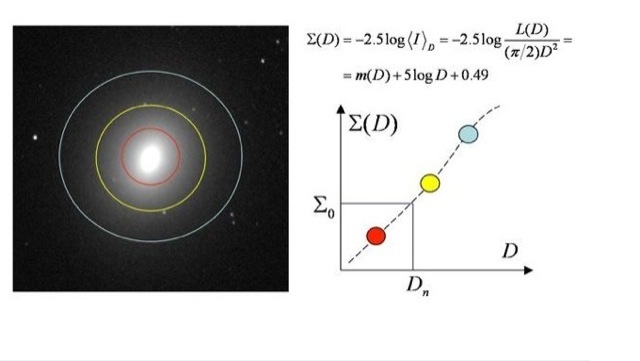 The figure shows the FJ relation for a sample of elliptical galaxies and bulges of spirals covering a large range in luminosity. From Chilingarian et al., A&A, 466, L21, 2007. Dressler et al. 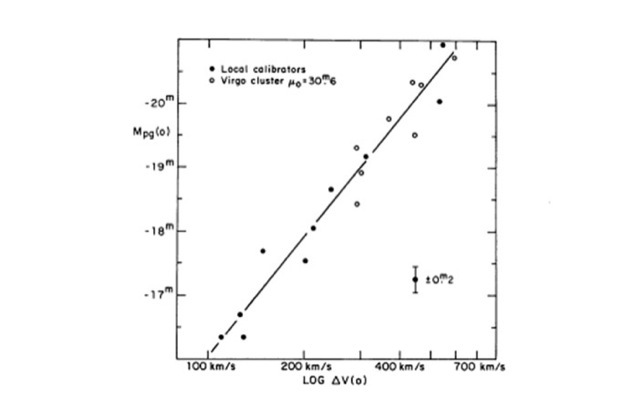 (1987, Ap.J., 313, 42), self-nicknamed the “Seven Samurai”, used a modified version of the FJR to derive a powerful distance indicator for elliptical galaxies, which allowed them to estimate in 150 to 350 km/s the infall velocity of the Local Group towards the Virgo Cluster. The reason is that, for nearby galaxies, the value corresponds to apertures large enough to absorb seeing blurring and off-centering errors [expand], situated within a range rich of photoelectric aperture photometry (photoelectrical fluxes measured through centered circular diagrams). With this choice is calculated by interpolation. The Seven Samurai showed that correlates well with just . Geometrical interpretation of the photometric parameter Dn. Projections of the Fundamental Plane (from Kormendy and Djorgovski, Ann.Rev.A.A., 27, 235, 1989). That is, if E galaxies obey the prescriptions of the model, i.e. they are in Virial equilibrium, they form an homologous photometric family, e.g. they all follow profiles, and is a regular function of , and if the mean value of the mass-to-light ratio does not vary from galaxy to galaxy, the effective radius, the mean effective surface brightness, and the central velocity dispersion define a surface, which we shall call Fundamental Plane (Djorgovski and Davis, 1987). It is apparent that the Faber-Jackson relation is just the projection of the Fundamental plane onto the dynamical versus the photometric axes. The other projection, onto the versus plane, that we have already seen, is not as straight, having a different behavior for normal and bright galaxies. Is the Fundamental Plane really fundamental? The question is still open. Since, as we saw, the dependence on is weak, this transformation sets the Fundamental Plane almost perpendicular to the axis. Sections through the Fundamental Plane in the k space (from Bender et al., Ap.J., 399, 380, 1992).